Equip your kids with self-defense, teamwork, and fighting chance in a safe & comfortable environment. Let us know ahead of time to get important information before you visit! "Fantastic instructor. Professor Cris really knows what he is talking about, not to mention he is great with kids. Everyone was very friendly and welcoming! No one will try to smash you in here, it's about learning with many high belts to learn from. Simply a great place! The place I'll miss the most in San Mateo." "I just had the privilege of training at Charles Gracie BJJ and it was truly an honor. The professors and students are some of the most welcoming and friendliest people I have met in the BJJ world. But don't let the friendliness fool you, because they are tough as nails." "I would give this establishment 20 stars if I could. My daughter started Jiu-Jitsu about 4 weeks ago twice a week and she LOVES IT, I mean LOVES IT! Cristiano is an AMAZing instructor and he is super wonderful with the kids. He keeps the attention of the class and does not take any crap, which I love." "I usually train at the Charles Gracie/BAFA academy in Hayward, but recently had the privilege to attend a couple classes here. My first impression of the school is that the place is immaculate. Very clean and tidy, just how a Jiu-Jitsu school should be. The instructors are pretty awesome! Cristiano is the head black belt instructor and is doing a great job leading the classes." "I've been doing Jiu-Jitsu for about 8 years, and 3 years under Christiano Xavier. My 9 year old daughter also trains at this academy and loves it. I love the people here. It's a very friendly and respectful atmosphere. Christiano is always there and really cares about the students. He keeps the place very clean. If you want learn this art, this is a great academy for you." "The Charles Gracie Jiu-Jitsu Academy is a top martial arts academy, focusing on the Gracie way of Jiu-Jitsu with some MMA, Judo, etc. included for good measure. 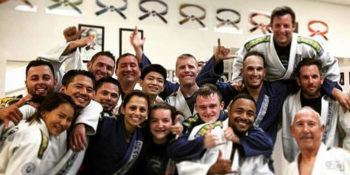 I have been part of the Charles Gracie Jiu-Jitsu San Mateo Academy for years, and truly feel honored to be part of a great academy family of Jiu-Jitsu practitioners." My son has been training here for over 3 years now, and recently my daughter joined. The coaches are great. They really care about the kids, they really prepare them for everything. The place is really clean and everybody is friendly, like a big family. Come and see it yourself. We take our child here and are extremely happy with their progress under Professor Cristiano and the CGSM coaches. Not only in Jiu-Jitsu, also their growth into a young person who knows how to respect others while having confidence in themselves. You can't do any better. The Charles Gracie network of academies means that several different black belts show up to help train. Cristiano is the head professor and he does a great job. Over the last several years I have seen more shy and timid kids begin, only to become confident leaders. Kids who are either bullied or just lack self-confidence truly learn the values of hard work, discipline, and respect.